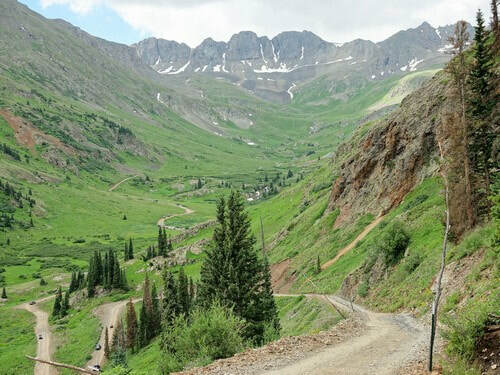 One of the most popular and heaviest used trails in the Silverton Area - and with good reason. 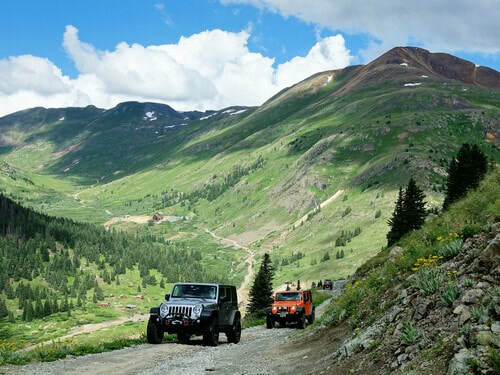 Fantastic alpine Jeeping. 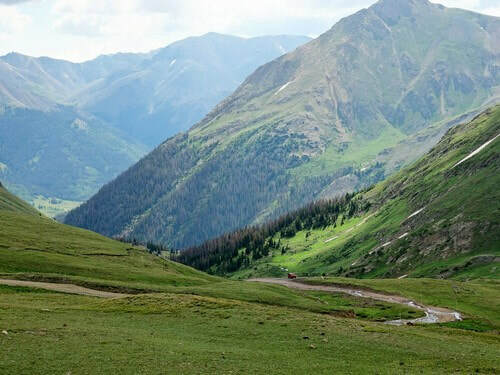 Tucked away in the San Juan Mountains of Southwestern Colorado is one of the true gems of our public lands. Sculpted by the forces of volcanoes, glaciers, and wind and rain, the resulting mountains, valleys, streams, and lakes are a masterpiece of nature's artistry. Native Americans came to these mountains for centuries to hunt and gather food. In the late 1800s they were replaced by miners who came in search of a different livelihood -- silver, gold, lead, and zinc. These hardy pioneers carved a network of roads through this rugged terrain to enable them to transport ore and supplies by mule-drawn wagons. Today, most of the mines are closed but the roads still remain. They are used by a different sort of adventurer - folks who travel by 4-wheel-drive or motorcycle or mountain bike. Although technology has made it easier for us to visit these mountains, it has not diminished their beauty or the adventure to be found here. One thing that has changed is the name. We now call this system of roads the Alpine Loop National Back Country Byway. Most of the area is public land managed for you by the Bureau of Land Management and the US Forest Service. It is wild country and perhaps not suited to everyone's taste. But, if you are able to appreciate nature on her own terms, we think you will agree this is a very special place. 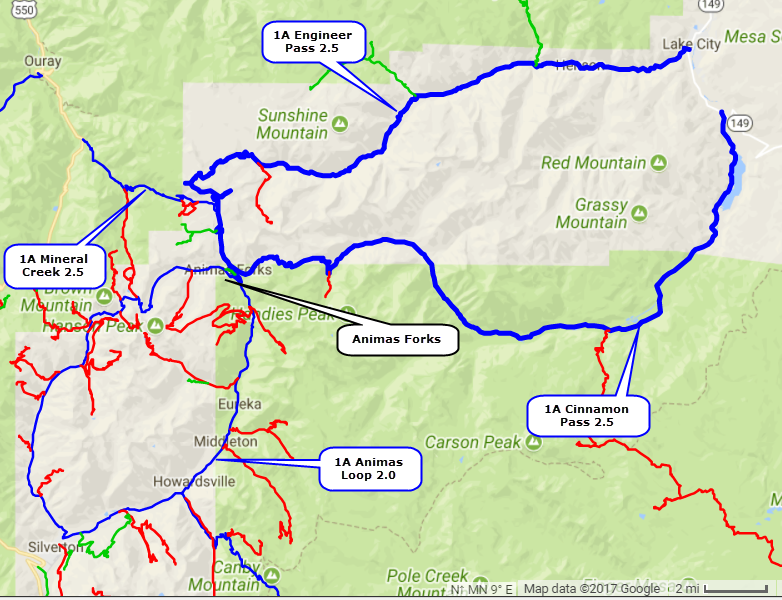 Most maps show the Alpine Loop going from Silverton to Animas Forks, then east over Cinnamon Pass to Lake City. From Lake City it returns west over Engineer Pass and down Mineral Creek to US 550 outside of Ouray. This website concentrates on Animas Forks and on Engineer and Cinnamon Passes. You can get to these by either of the Access Roads 1A Mineral Creek 2.5 or 1A Animas Loop 2.0. Be aware that 1A Mineral Creek 2.5 is a STRONG 2.5 rated trail and is NOT suitable for regular vehicles. You can climb over Engineer Pass to Lake City, then cross back over Cinnamon Pass, or you can do the run in the reverse direction. Both directions are fantastic. You can drive the loop in many SUVs with good clearance, though you may find challenges near the two passes. It is usually a busy Jeep trail, so if you have troubles it will probably not be long before someone finds you. The First prospectors wintered in "Three Forks of the Animas" in 1873, looking for silver and gold. In 1875 the name was changed to Animas Forks to accommodate the Post Office. By 1885, the summer population reached 450 people. Animas Forks was off to a good start in 1875 and advertised itself as being the "largest town in the world." But then the fine print that followed said "at this altitude" which was 11,300 feet above sea level. Avalanches were the curse of the town. Often, the snow would slide down one side of the mountain and up the other side, the sides of the canyon being that close together. At one end of town were the mines and mills together with a boarding house, which served other purposes as well. The 70s and 80s were good years for Animas Forks but it didn't last into the next century. Most of the richer mines began to peter out forcing the mills to close down and allowing the town to return to a much slower pace. 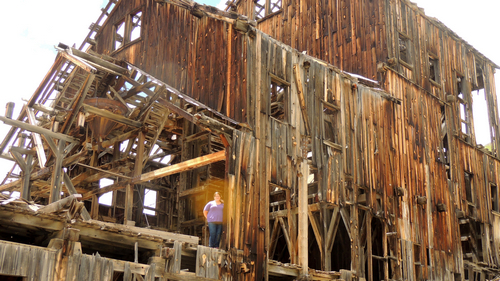 You can look up California Gulch from Animas Forks and see the remains of the Frisco Mill and Bagley Tunnel. The objective of the 7,500-foot Bagley Tunnel, which ran straight into the mountain, was to intersect rich veins of gold ore. Previous to starting work on the tunnel, the owners had consolidated 140 claims. From the tunnel, cross-cut passages allowed access to the ore. The ore was brought to the Bagley Tunnel for transportation to the Frisco Mill immediately outside the portal. Work started on the tunnel in 1904 and continued until 1911. It was an expensive investment that took nine years to break even. 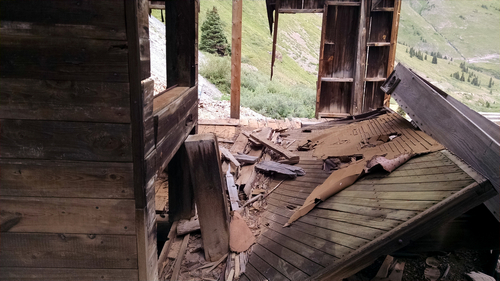 The mill was completed in 1912 with materials hauled to nearby Animas Forks by the Silverton Northern Railroad. All pieces were pre-cut and pre-fitted to allow rapid assembly of the mill. At one time, there were a number of buildings associated with the operation of the mill and tunnel including a boardinghouse. Other structures included a compressor house, mine manager' home, blacksmith shop and tool shed. Time and vandals have wiped out almost all traces of these structures. Wilfley tables were used to separate gold from the ore (also used for copper). It appears these funnels were used to feed the tables. At its height, the complex had 40 employees. 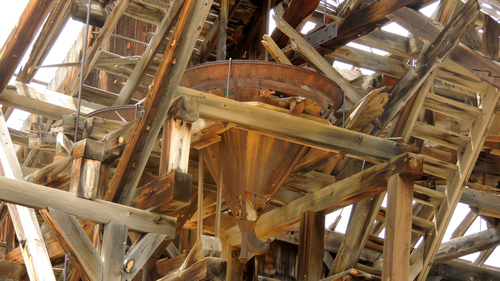 With the ore exhausted, the operation was shut down in the 1920s. 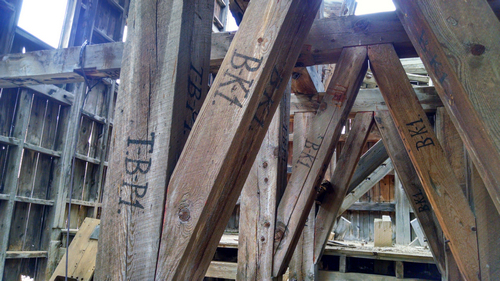 Over the years, the mill has been badly vandalized. In the 1970s, it was partially dismantled for its weathered wood. In 1990, the property owners stepped in and started stabilizing the remainder of the structure. By this time, however, the entire south end of the mill had collapsed due to removal of the siding which compromised its structural integrity. As of this writing the mill and modern cabin are for sale. 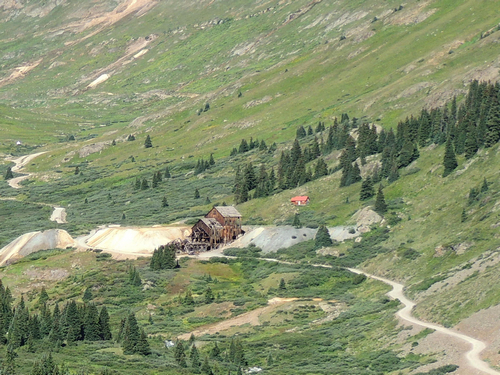 Engineer Pass was constructed by Otto Mears and was completed in August of 1877. By 1880 the Rocky Mountain Stage and Express Company was providing daily stage service between Lake City and Animas Forks using Engineer Pass. As you start climbing up toward the pass from the west be sure to take the spur to the right. This leads to a saddle with a great view of what is ahead of you on the east side of the pass (left photo). You can also see into hurricane Basin. Continue on the main road and take the left spur to "Oh Point" with spectacular scenery on the west side of the pass. Cross over the pass and follow Henson Creek all the way to Lake City (right photo). 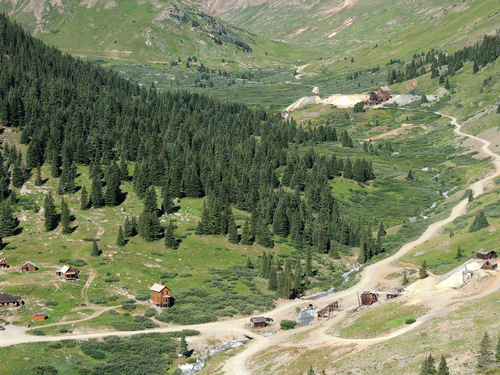 Cinnamon Pass was used in 1860 by Charles Baker to access the area where Silverton is today when he was exploring for gold. Baker Park was started in the broad valley that is now the site of Silverton. In 1874 the Hayden Survey party crossed Cinnamon Pass and passed through Baker Park, now on its way to its mining boom. The survey team did not feel that Cinnamon Pass would make a viable wagon route due to its altitude and steepness. With the need for access from the east to the mines of the San Juans, Enos Hotchkiss began work on just such a wagon road. In 1877 the wagon road was completed and it became an important link between Lake City and the Animas valley. It even had a phone line strung over from Animas Forks to Lake City. 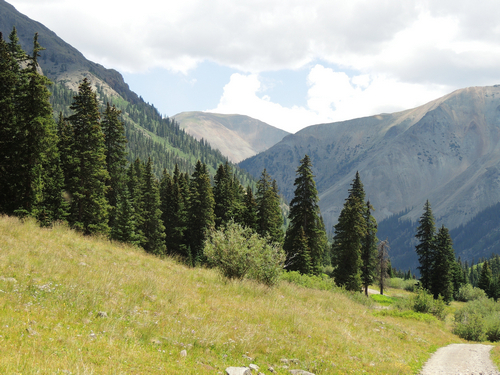 Head east from Animas Forks and climb up toward Cinnamon Pass. This is a good chance to get an overview of Animas Forks and California Gulch beyond it. ​Drop down the east side of the pass and on toward Lake City. 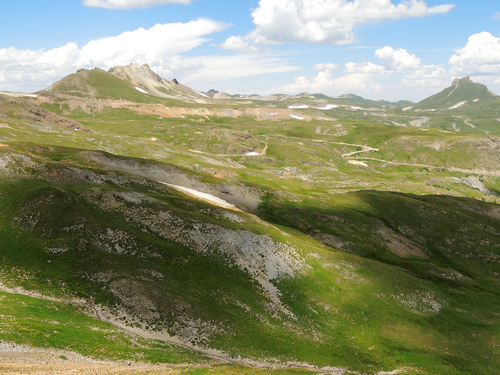 Pass the mouth of American Basin 2.0 as you leave the alpine region.